Both researchers of the GI2AM group of the Universitat de València attended from 13th to 16th of July to the 16th European Congress on Biotechnology held in Edimburgh (Scotland) to present their work towards understanding the effects of the operational conditions of biotrickling filters in its microbial community. Portune, who is the experience researcher in microbiology recruited for the Next Air Biotreat project, presented the poster entitled “Evaluation of dynamic microbial communities in a styrene-degrading biotrickling filter using 16S rDNA tag pyrosequencing and denaturing gradient gel electrophoresis”. 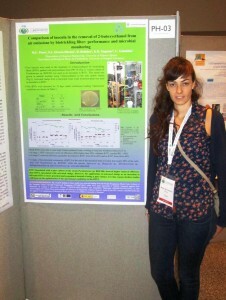 From her side, early stage researcher Pérez presented the poster entitled “Comparison of inocula in the removal of 2-butoxyethanol from air emissions by biotrickling filter: performance and microbial monitoring”, which has been performed with the support of the Department of Biological Waste Air Purification of the University of Stuttgart (Germany). 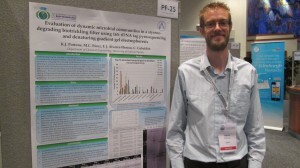 These research works have been cofunded by the Next Air Biotreat project.